Gilda is a spirited (to put it nicely) warrior from the Dhaledan Clan. After a few false starts, she was finally accepted into the Sisterhood - the Dhaledan's caste of women fighters. Tragically, her squad - Hand of the Dusky Maiden - was slaughtered in a grune ambush. She was the only survivor and was taken prisoner. Because of her relatively young age and the loss of her Sisters, she has yet to receive her traditional Dhaledan tattoos. She was rescued, along with the Peryton girl Varli, by Rolan. She is still ashamed of that incident. Gilda is short and squat, like a miniature tank. She has an abundance of energy which she expends by fighting and working out. She is powerful, sarcastic and has a temper, but is a valuable asset to anyone in a fight. Provided she's on the same side, that is. You can pick up the first issue of Grune here! I've always been attracted to obscure and lesser-known cartoon characters. I'm not sure what it is. Maybe it's the idea that since a lot of people don't know them, they were made just for me. One such character is Charlie Dog. Charlie was a homeless hound constantly on the scent of a new home. 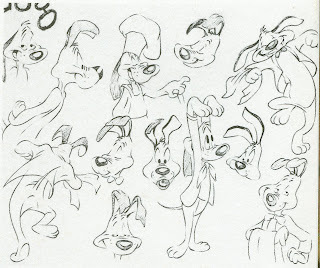 He was created by Bob Clampett as a sort of Pluto to Porky Pig's Mickey. 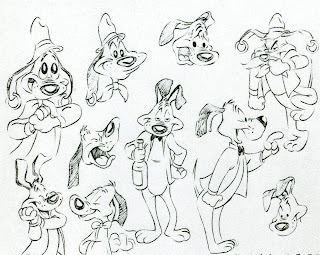 In the late 40's - early 50's, Charlie was retooled and revised by Chuck Jones. Something I love about Chuck Jones' designs and animation is that his characters have weight. They feel heavy and feel like they have a structure underneath. Watching Charlie in motion, you can tell that his ears have muscles keeping them up and alert. Charlie starred in just seven cartoons. As the Fifties rolled on, Chuck Jones became more interested in his own cartoon creations such as Wile E. Coyote and Pepe Le Pew. Charlie was essentially Bugs Bunny without the smarm. 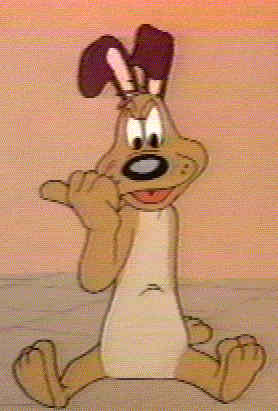 Even his voice affected the same sort of Brooklyn accent, although as seen in the cartoon above, he clearly had a gift for mimicry. * The dog was just as self-serving as every other member of the Loony Tunes stable, though it's somehow more forgivable since all he seems to want is a home. It's just too bad that his own zeal is what seems to hamper his chances at success. I'm not sure exactly what it is about Charlie's design that I like so much. It could be the fact that he seems to embody a sort of "every-dog". He's not a particular breed - he has a long tail, long ears, a big brown nose - traits that might seem awfully basic and boring for a cartoon dog. And yet he feels like a classic mutt, a sort of visceral representation of man's best friend. I'm not sure if Charlie ever found a home. He might still be out wandering the great U.S. of A. even as we speak, living off his wits until the day he can relax and finally enjoy his tender vittles. Which to me, sounds like a terrific comic story! I'd draw that. * Mel Blanc claimed to have the ability to do more voices than Wilt Chamberlain had sexual partners. But listening to Charlie versus Bugs... eh, you decide. I am a comic creator and illustrator. I post about my projects and about art, design and storytelling.